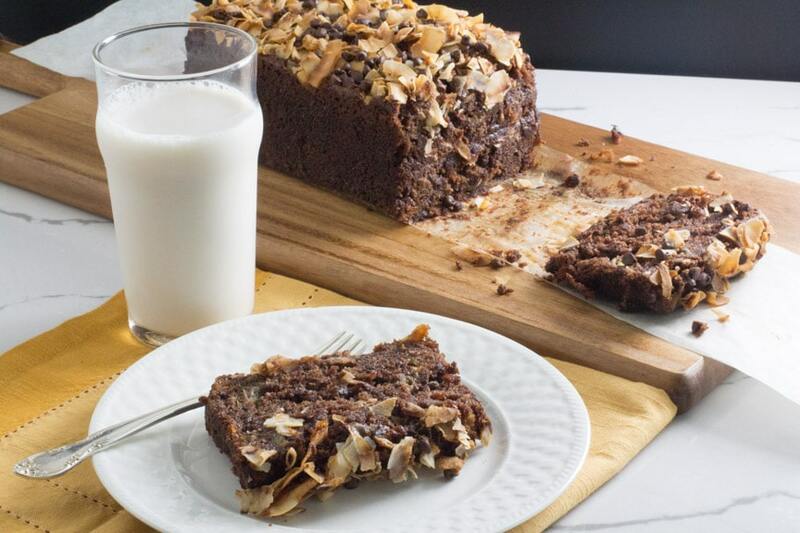 Chocolate + Coconut + Banana = YUM! 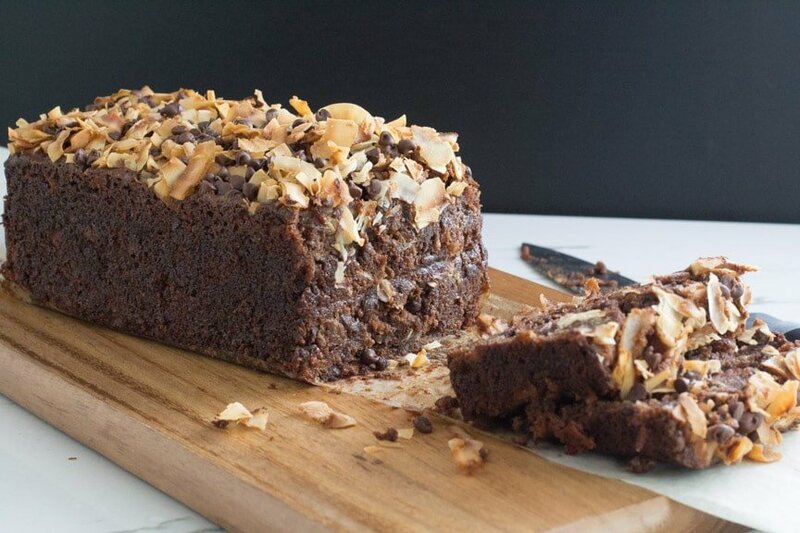 If you like banana bread, chocolate and coconut then this loaf is going to be your new best friend And it is gluten-free and low-FODMAP, if you follow our serving size recommendations, although it does push boundaries and is quite rich. You seriously couldn’t ask for more in terms of chocolaty gratification. This is as easy to make as our low FODMAP Banana Bread Muffins, yet so much more decadent. This would make a great brunch buffet offering. Its only downside is that it doesn’t travel well; the beautiful topping will become compromised – but it will still taste fantastic. For other, similar breads, check out our Poppy Seed Carrot Banana Bread and our Lower Fat, Reduced Sugar Banana Bread. Also check out our articles on All About Cocoa and All About Dark Chocolate. This is as special as the fanciest dessert, and yet it is as easy to make as banana bread. 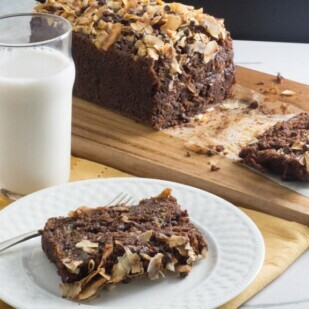 But this Chocolate Coconut Banana Bread has so much more - chocolate and coconut! Texture, flavor, moistness - make this now. Position rack in the center of your oven. Preheat to 350° F/180°C. Line the inside of an 8 by 4-inch loaf pan with a strip of parchment paper, overhanging the short ends. Coat the inside of the pan and the parchment with nonstick spray. Whisk the gluten-free flour, cocoa, baking soda and salt together in a large bowl and set aside. Whisk the oil, brown sugar and sugar together in a medium-sized bowl until well blended. Whisk in eggs, one at a time, until incorporated, then whisk in banana and vanilla extract. Pour these wet ingredients over dry ingredients and whisk gently until a few floury streaks remain. Add half of the coconut and about three-quarters of the chocolate morsels and fold in with a silicone spatula. Scrape batter into prepared pan. Sprinkle top with reserved coconut flakes and mini morsels. Bake for about 1 hour and 10 minutes to 1 hour 15 minutes. A toothpick should just be on the verge of testing clean when inserted in center. The coconut will be golden brown. Cool pan on rack for at least 45 minutes. Loosen the edges of the loaf from the pan by inserting a small spatula between the loaf and pan and run it all the way around the loaf. Use overhanging ends of parchment to gently lift the loaf out of the pan and place on rack to cool completely. Loaf is ready to eat but definitely slices best after an overnight rest. Loaf will keep for about 3 days wrapped well with plastic wrap at room temperature. If you cannot find the broad coconut chips you could substitute long shred coconut, but the visuals won’t be the same. If you go this route make sure they are unsweetened. 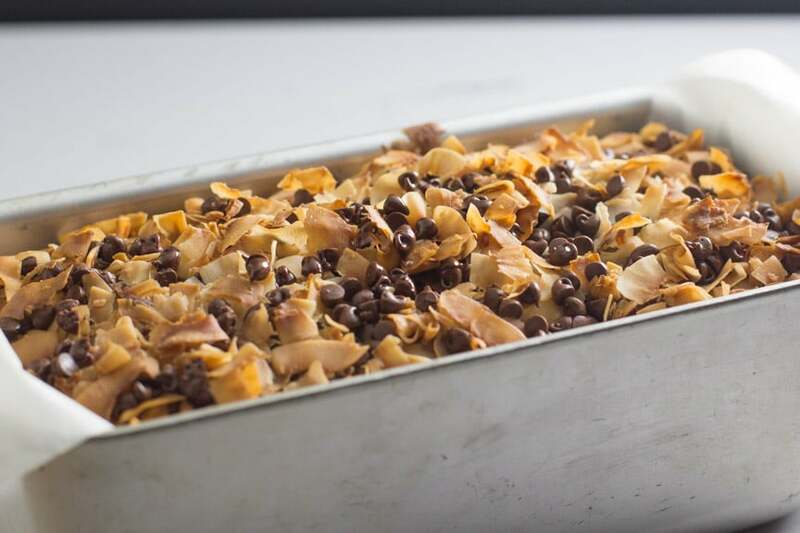 The “angel flake” log shred coconut found in most U.S. supermarkets is highly sweetened and could be used but will greatly alter the sweetness level of the recipe. You might have to mail order the unsweetened coconut or seek it out in whole foods stores. You can experiment with freezing this loaf. The loaf itself freezes very well as it is so moist to begin with but we think the coconut flakes suffer. You might think their fine so give it a go if you are curious. Fructans: If you passed the fructan wheat Challenge, you can use unbleached all-purpose flour instead of the gluten free flour. The loaf will no longer be gluten free. Use weight equivalents for most accurate results with this substitution.